Last few months, I was not in a mood to write an article to this blog. I had many documents to finish up, and for some of them, I could not keep the schedule and missed the deadline. For some other materials, the co-authors did their job already and wait for my reactions. Nevertheless, I was in a situation, in which I am embarrassed to write this blog. Well, the things are not that different, but I have missed too many things worth recording. One of such events is having Professor Wim Briels from Netherland. He is the well-known soft-matter physicist. In particular, among his achievements, several works for the modeling of polymer dynamics are quite crucial to me. One of the models called TWENTANGLEMENT is the simulation scheme to calculate the dynamics of strings that never cross with each other. The uncrossability is, of course, realized by the excluded volume interactions, just as made in the bead-spring simulations. TWENTANGLEMENT does not rely on the excluded volume but calculates the geometry of the infinitely thin strings mathematically. The other model is the so-called RaPiD, in which a soft-bead replaces one polymer molecule as a whole, and the entanglement between the polymers is implemented as virtual springs. I have been attempting for the modeling of polymer dynamics, and my models are located between TWENTANGLEMENT and RaPiD. Nevertheless, there are not many researchers worldwide for the development of polymer dynamics with the multi-chain descriptions, and I highly respect his achievements. In the last October, he kindly stayed in our group for a week. Taking the opportunity, we organized a workshop and had his lecture. We took the photo above at the party after the event. 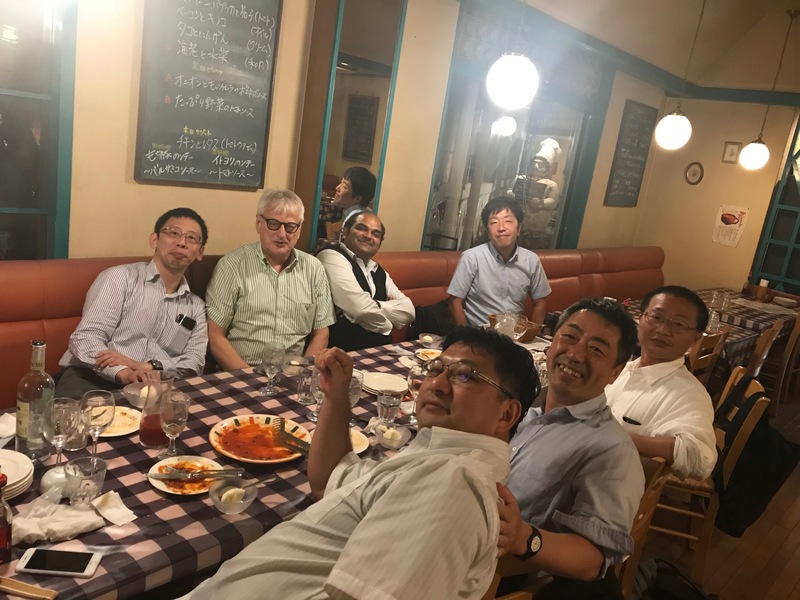 (Top from left to right, Uneyama, Briels, Sathish, Masubuchi, low from left to right, Hagita, Taniguchi, and Noguchi) I wish to keep this relationship to see the whole construction of the multi-chain modeling of polymer dynamics. I have not traveled around Netherland, and I will seek an opportunity to visit him there.